The writer, a Michigan native, earned a Northwestern University journalism degree last year and now lives in New York. 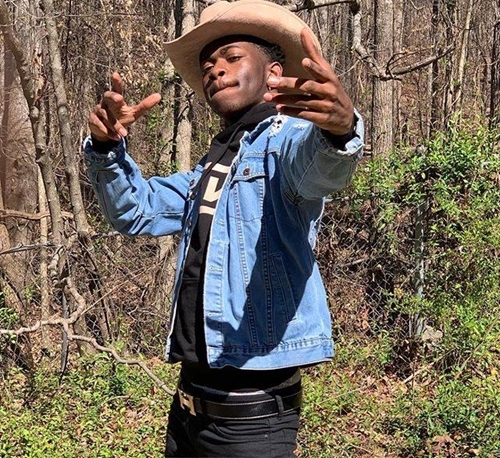 Teen rapper Lil Nas X released “Old Town Road,” a devastatingly catchy blend of country and trap music, last December. By mid-March, the song was climbing toward the top of Billboard's Hot Country Songs chart, largely driven by online virality as the soundtrack to memes and videos on TikTok and other social platforms. But by March 26, it was gone from the chart. Billboard didn’t announce its decision until Rolling Stone started digging and was told the song “does not embrace enough elements of today’s country music to chart in its current version.” Cue a widespread discussion over the possible racial motivations behind the decision (Billboard denied this), the value of music genres in 2019, and the long history of country and hip hop influencing each other. This catchy blend of country and trap music, released four months ago, tops Billboard's Hot 100 list this week. Of course, the internet is more powerful than any measly music chart. The original music video has 36 million views and counting. Over 47 million clips on TikTok are tagged with the song. On April 4, Lil Nas X released an"Old Town Road" remix with country legend Billy Ray Cyrus that exceeds 30 million hits already. By April 8, “Old Town Road” hit number one on the Billboard Hot 100. Detroit, where horseback riding and country music are nothing new, this month grabs its own piece of the current attention. Dee White, a 23-year-old online apparel entrepreneur, tweeted a video taken by friends while driving near Seven Mile and Huntingdon. It shows two horsemen riding along the west-side sidewalk, perfectly timed as “Old Town Road” blasts in the background. "Dawg I love Detroit," White says in his April 5 post, retweeted more than 35,000 times and "liked" 92,000 times. The men in the car and those on horseback immediately know why the combination is hilarious, a sign of the ubiquity of the "Old Town Road" song-meme phenomenon. The Detroit video itself has since gone viral, poised to break four million views on Twitter. Viral content, inescapable for anyone with a pulse in 2019, has a curious characteristic: A library's worth of context can pack into just seconds of video, a few words of text, or an image or two. In this case, it’s Detroit’s surprisingly deep history with both horseback riding and country music. As Chicago writer Mikki Kendall pointed out in reply to White’s tweet, urban black riders have been around for decades in Los Angeles, New York, Baltimore, St. Louis and Philadelphia have been around for decades. Detroit is no exception. In 2012, WXYZ profiled Jordan Miller, who settled into a routine of riding his horse around his Detroit neighborhood, even getting a permit to do so. Over the past few years, the Detroit Metro Times tracked sightings of Speed Miller, nicknamed, the “Greenfield Gaucho,” before finally catching up with him last fall. Eron Rogers, one of the riders in the viral video, told Deadline Detroit that he rides with both Millers regularly. But it doesn’t stop at one-off riders. Detroit’s mounted police have been around since 1893 and peaked in the 1970s, with more than 80 officers and 60 horses. Though it briefly disbanded in 2005, the unit now has sustainable funding and earned a viral moment last year when an officer rode down a texting driver. Since 1985, the Michigan Black Horsemen’s Association has worked to gather and educate Detroiters “in the cultural concept of the black cowboys, cowgirls and their historical participation in the growth of horsemanship in the West and throughout the nation.” Picnics and rides take place regularlty. In Rouge Park on the city’s west side is the Buffalo Soldiers Heritage Center, where volunteers -- in partnership with the city and local residents -- maintain a stable and give tours, lectures and rides in honor of legendary black regiments that fought with distinction in American military conflicts for nearly a century. James Mills, the center’s first sergeant, grew up in Detroit’s North End and learned to ride and care for horses at a stable there 70 years ago. “Something happens to kids when they are exposed to something besides dogs. It even changes the way they connect to people,” he told local author Desiree Cooper in 2015. Former teacher David Silver launched Detroit Horse Power in 2015 as a way to use Detroit’s plentiful vacant land and teach local youth riding and horse care skills “as a way to broaden students’ horizons and promote social-emotional growth,” as he has written. The organization offers summer camps and a year-round after-school program, and is pushing for a permanent facility. Black riders have popped up in Metro Detroit, too. The most famous example, of course, is Joe Louis himself, who bought Spring Hill Farm, an area of Shelby Township that is now River Bends Park, in the late 1930s. Louis remodeled the 250-acre farm to include extensive stables and a track where he would host horse shows. Today, one of the top young competitive riders in the country is Jordan Allen, who grew up and began riding in Holly. Allen, on a gap year before starting at the University of South Carolina this fall, is one of very few black elite riders. “I wish the sport was more diverse. I’m not just doing it for me; I’m doing it for so many people. Not even just African Americans, [but] so many different kids,” she says recently in The Chronicle of the Horse. Riding is one thing—an activity that requires plenty of time, skill and money. But music is more central to Detroit’s identity than possibly anything else -- Motown, techno, gospel, jazz, rap, the list is endless. And yes, country music, too. As early as the 1920s, Henry Ford, perhaps for characteristically intolerant reasons, was promoting “old-fashioned dancing” and fiddle contests. Then came a series of successful artists, many chronicled in a 2013 book, "Detroit Country Music," by local collector Craig Maki. The 1940s hit “Hamtramck Mama” by the York Brothers was so popular the city’s mayor attempted to ban it. Beginning in 1954, WWJ broadcast the Michigan Barn Dance, a country music TV show, every Saturday night. A few hours earlier in the evening, WXYZ was airing The Lazy Ranch Boys Barn Dance on the radio. In 1983, the Detroit Downtown Hoedown began, one of the largest free music festivals in the country. The 1990s saw the rise of Kid Rock and his sidekick, Uncle Kracker. And the Michigan Country Music Hall of Fame, started in 1971, now counts more than 200 inductees. That lesser-known history exists in the shadow of genres most Detroiters know much better. Rappers like Royce Da 5'9, Big Sean, Proof and Eminem have joined the dozens of legendary Motown figures on the list of successful local musical exports. Where the two intersect is more hit and miss. Out of over 200 artists in state Countrty Music Hall of Fame, one is black: Homer Jones, a 1990s retiree who pursued an amateur career on a whim. Decades earlier, rockabilly artist Johnny Powers grew up in Detroit, signed with Sun Records in 1959, then switched to Motown Records the following year, where Stevie Wonder would sometimes hide his guitar as a prank, he said in a 2014 WDIV interview. He was Motown’s first white artist, and may have been the only person to have a contract with both legendary labels. But Motown, of course, isn’t rap. Recent years have seen a physical separation. In 2016, after decades in downtown Detroit, the WYCD Hoedown moved to Clarkston. And after Gov. Jennifer Granholm denied funding to the state fair, an annual celebration of rural Michigan, it wasn’t held for two years. When her successor, Rick Snyder, brought it back, it relocated to Novi. Hick hop, or country rap, has been one source of overlap. Kid Rock’s late 1990s track “Cowboy” is perhaps the most famous Michigan-based example, but it continues today. Joe Commisso, a local artist who helps run local site DetroitRaps.com, points to 2013’s “Country Boy” by Chad Kush as another example. In Dee White’s circles—he manages Detroit rapper Vince Heartbreak (one of the Seven Mile viral video makers) and reviews new material on YouTube—he doesn’t see much direct country influence like what’s in “Old Town Road.” But tracks like “Ghetto Champagne” by East Sider Sada Baby have unmistakable soul influences. But in a post-”Old Town Road” world, White only sees the country-rap mashup trend continuing, and Detroit could well be a part of that. So many Motor City artists from every genre—rap, country, Motown, jazz—have southern roots, and with so much southern influence in current hip hop culture, it’s a small step to inject that back into Detroit’s music scene today.